You are invited! 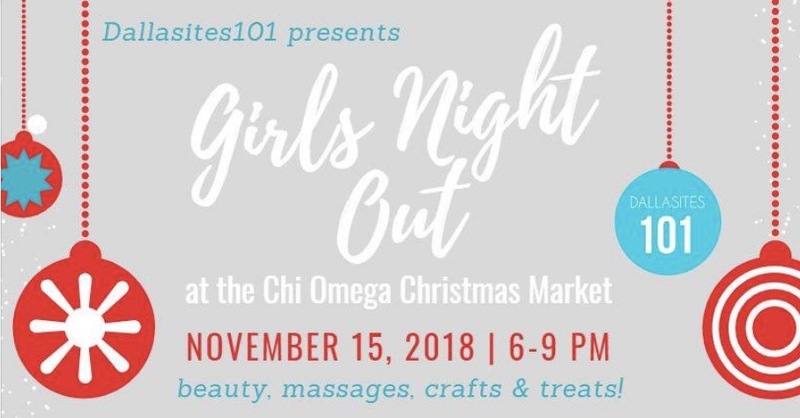 Please join Dallasites101 on Thursday, November 15th from 6-9pm for a Girls’ Night Out at the Chi Omega Christmas Market "41 Years of Giving" 2018! This special event will take place at Centennial Hall in Fair Park and is the ONLY time that you can shop the Annual Chi Omega Christmas Market late-night! It is truly the perfect opportunity to take care of your holiday shopping, enjoy complimentary beauty, spa and craft services, and support a fantastic cause! - Lushra for custom glassware like wine glasses with the Dallas skyline! - and Vivian's Boutique Spa offering complimentary mini massages and seasonal spa products! Tickets for General Admission are available online for $12 (door price will be $15). Purchase your ticket now at http://www.chiomegaxmas.org/page.cfm?Page=TICKETS or area Tom Thumb stores while they last.